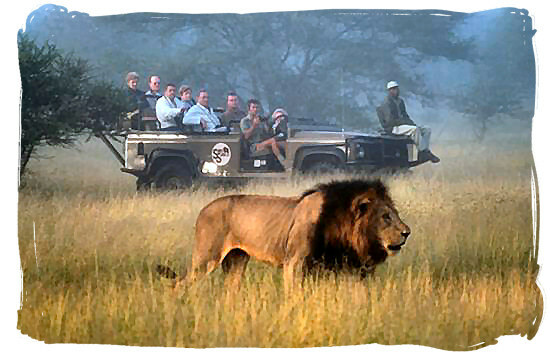 People flock to our shores to embark on the most amazing wilderness adventure, the African Safari! Whatever your particular wildlife desires might be South Africa has everything to personalize your experience and make your safari dreams a reality. We have the Big 5, giraffes, hippo's, zebra's, cheetahs, buck and antelope, as well as a host of other rare wildlife such as the African wild dog and the lesser known little 5 (Leopard tortoise, ant lion, rhino beetle, buffalo weaver, and the elephant shrew) to observe in their natural habitats. Get up close to the most spectacular wildlife without sacrificing comfort while staying at our lavish 5 star safari camps and lodges. By far the most consummate game reserve is the Kruger National Park, which stretches through the Limpopo province and Mpumalanga. 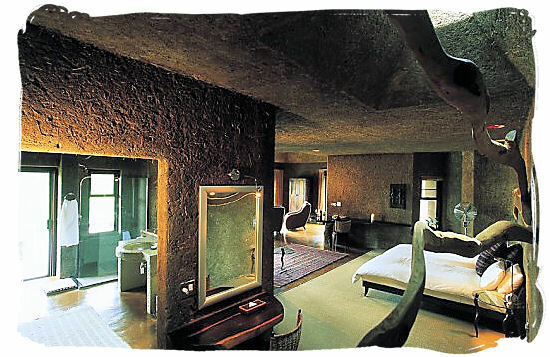 Luxurious accommodation at the Earth Lodge in Sabi Sabi private game reserve. You are unlikely to get a better safari anywhere else. Along the Western border of the park you will find Timbavati, Manyeleti, Balule, Thornybush and Sabi Sands, all of them award-winning private game reserves. They are considered to represent the finest in luxury hospitality and guarantee you an authentic game-rich experience. Offering world-class standards exceptional close wildlife encounters, personal service, delicious cuisine and personal service and delicious cuisine, Sabi Sabi private game reserve has received international acclaim for its unforgettable luxury safari experiences. These premier reserves contain the best safari camps and lodges in the world, the most coveted being Royal Malewane in the Thornybush reserve and Singita at Sabi Sands and need to be booked more than a year in advance. They all serve gourmet cuisine, have extensive wine cellars and have spared no expense in creating a traditional ambience with their décor. 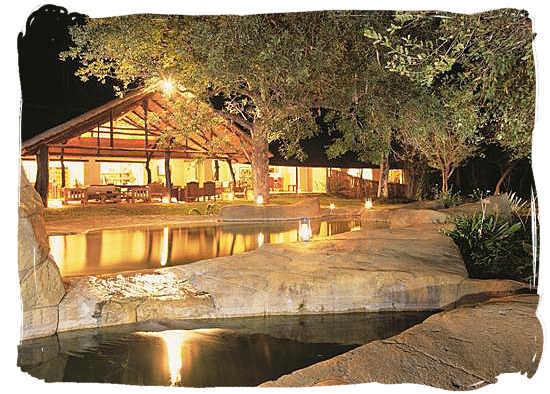 Chapungu Lodge at the Thornybush private game reserve. A uniquely elegant South African style and flavor echo through them all. Private decks with outdoor showers and the most exquisite views of the African bushveld, private heated pools, lavish suites and bathroom facilities, luxury spas and world-class hospitality ensure that staying here is nothing short of a visit to paradise. But the real 5 star experience is not in the accommodation and the food, but in the wildlife spotting. Guided game drive at Sabi Sabi private game reserve. All the private game reserves have land rovers for exclusive game drives and employ only the most professional, knowledgeable and experienced game rangers and trackers. While no safari lodge can guarantee animal sightings, these expert rangers and trackers greatly increase your chances of seeing even the most elusive of creatures, like the leopard. 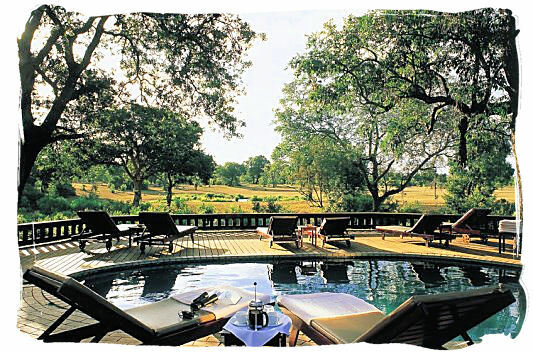 Pool deck of one of the lodges at Sabi Sabi private game reserve. If you are very lucky you may even be privy to the incredibly intimate and thrilling experience of seeing one of these majestic predatory creatures make a kill. All these reserves have the option of taking walking safari's which are not only exciting and exhilarating, but also really bring an intense vulnerability to your safari experience. Game drives can be undertaken by day or night, with off road routes providing the most memorable close up encounters with Africa's beautiful wild creatures. 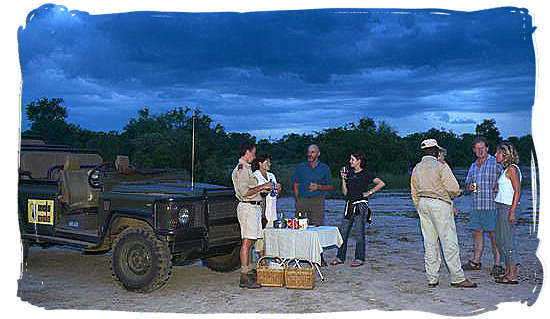 Enjoying sundowners on a game drive in the Mala Mala private game reserve. The lodges are so designed that large viewing decks with dining areas overlook the watering holes and this affords visitors one of the most superlative game viewing experiences when all the wildlife gathers to drink. Delicious food, eaten under a canopy of stars or the blazing African sun, while watching spectacular wildlife, evokes an enchanting and rare kind of magic that captures the spirit of nature and luxurious indulgence in one unique experience. 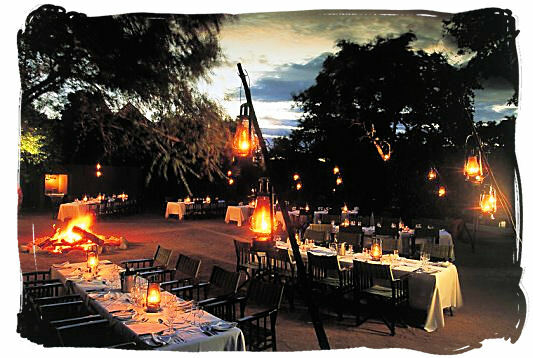 Dinner is ready in the Boma at Sabi Sabi Selati Lodge. Few countries can offer as much as South Africa for the ultimate safari adventure. The best of the African wilderness is epitomized here. Our game viewing experiences and impressive accommodations are unparalleled. As the Safari Industry's blueprint to the luxury safari, MalaMala Game Reserve is the largest private Big Five game reserve in South Africa. You will be spellbound by the sight of the animals and are assured a top quality vacation full of memories you will treasure for the rest of your life. So if you are passionate about wildlife, come let the African bushveld steal a piece of your heart.